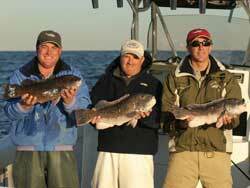 For light tackle blackfish (tautog) we recommend a spinning rod and reel combo suitable for 20lb fused line. The optimal rod is 6’6″ to 7′ feet long with a fast to extra-fast action and capable of handling lure weights up to 1 ounce. Some anglers prefer to use 20lb fused line as opposed to 30lb fused line because the slightly decreased line diameter can provide additional casting distance when flipping small jigs away from the boat in search if the best structure. Other anglers use 30lb fused line to ensure they can pull even the biggest fish hooked fish off the bottom before they find safety in the structure. We recommend loading the reel with 20-30lb fused line as opposed to braided line or mono. Fused and braided lines allow for much greater casting distance than mono. This is because is the much smaller line diameter of fused and braided lines. In addition, the fused and braided lines have virtually no stretch which allows the angler to carefully work even the most difficult lures, feel the softest hits, and easily set the hook. Fused line is preferred to braided line because it has better abrasion resistance. The line should be attached to a 3ft length of 30lb fluorocarbon leader use a 50lb barrel swivel. The small profile of the swivel virtually eliminates any chance of picking up debris and provides an easy connection point between the line and the leader. The angler needs to be careful not to reel the swivel into the rod as it can damage the guides. Some anglers use an albright or uni-knot instead of a swivel. This knot can be tricky to tie properly with braided and fused lines. We recommend using jigs that are just heavy enough to hold the bottom. The greater the depth and current. the heavier the jig that is required. Jig weights from 1/4oz all the way up to 4oz can be used. If you purchase jigs with hair, simply remove the hair before using it. The preferred colors are green, orange, green/orange, and yellow.